In the heat of the summer we all need to stay hydrated. This is especially true for kids and seniors. Before you reach for a fast food frappe drink, which is loaded with sugar, try making your own frozen drink. Add equal parts 100% juice, coconut water and ice cubes to a blender and let it rip. Or make an icy cold frozen cocoa. I created my recipe for frozen cocoa after watching an episode of Oprah many years ago. Ms Winfrey was drinking a high fat whipping cream topped frozen cocoa and dancing around the stage in chocolate heaven! I knew I needed to create a healthier version so after many tries I came up with this beauty! All you need is a blender, some natural cocoa powder (see below), skim milk, skim milk powder, some sweetener, ice cubes and you are good to go. If Ms Winfrey’s dancing around isn’t a big enough incentive to make this drink, how about this: a study out of Spain published in Nutrition, Metabolism and Cardiovascular Diseases touts the combined benefits of cocoa and milk. In the small randomized study the people who received 500 mL of skimmed milk/day with 40g [about 4 tbsp (60 mL)] of natural cocoa powder for 4 weeks raised their HDL cholesterol by 5% and lowered their bad LDL cholesterol by 14%. Not bad for a chocolatey drink. Before you down any chocolatey drink you need to know that the study was from the Spanish food company Nutrexpa, who make a high flavanol cocoa powder. If you want to even come close to these cholesterol lowering affects you need to be using natural cocoa powder which has at least two-thirds more heart healthy flavanols than regular Dutched or alkalized cocoa powder. 1 Tbsp (15 mL) granulated sugar or sweetener of your choice, I like Agave or honey – this isn’t a sweet version so you may want to add a bit more sweetener – but don’t go overboard or use stevia, my favourite is from Splenda. Put all ingredients into a blender. Whirl till smooth and the ice is blended in. This is slightly noisy, but well worth it. Divide into 2 equal servings, share. Viva La Frozen Cocoa! Each 1 ½ cup (375 mL) serving contains: 145 Calories, 2 g Total Fat, 0 g Sat Fat, 0 g Trans Fat, 90 mg Sodium, 18 g Carbs, 1 g Fibre, 9 g Protein. Where do I find skim milk powder? It’s in the same aisle as the canned milk, usually on the bottom shelf. Loaded with protein and calcium it can really bump up the nutrition and the creaminess of a blender drink. Marilyn: Just watched you on Cityline making Christmas cookies. Loved the episode and have printed off your recipes for this years baking . I have one ten year old grand daughter that loves to bake and I will be giving her your website to look over. Your healthy happy attitude makes me smile and makes your TV appearances so much fun to watch. Keep up the great work. So glad that you are going to bake these with your grand daughter! And let me know about the meal replacement. 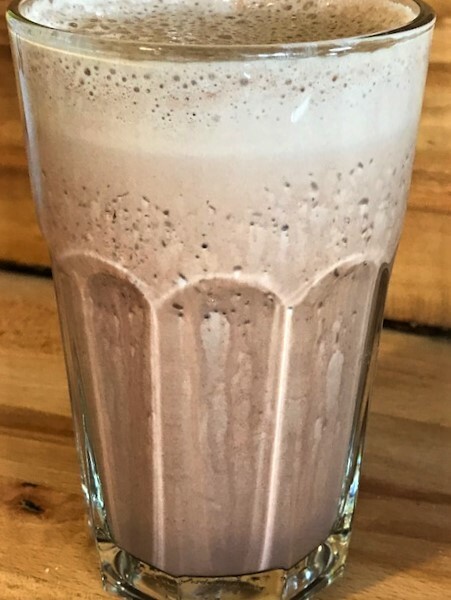 I have been using a nutritional meal replacement for a few months for weight reduction and will be trying your Frozen Cocoa recipe to add some variety to my regime. Can I use my meal replacement instead of the skim milk powder? It is soy based. Don’t know if it will work, but I think you could totally give it a go – the flavour will be different, but it is similar to skim milk powder in texture. I will be trying the frozen cocoa recipe for sure. A day without chocolate (cocoa) is like a day without sunshine….that really should be ‘week’ instead of day but it sounds better. I will be subbing almond milk (the 30 cal per cup stuff) for the skim milk. Shouldn’t make any difference. I’m a chocolate lover too, so glad that you liked the drink, and it might be a bit sweeter with the almond milk.